Review: Boy21 by Matthew Quick (review copy) - It's never been easy for Finley, particularly at home. But two things keep him going: his place on the basketball team and his girlfriend, Erin - the light in even the darkest of his days. Having just finished reading a really moving novel, I was eager to read something equally as moving. 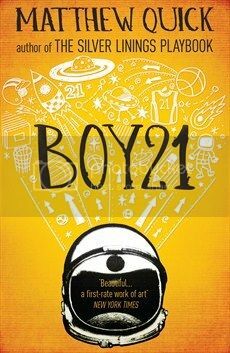 Matthew Quick has moved me in the past, so I eagerly picked up Boy21 expecting to be blown away. I'm sad to say that I was let down. Finley is a quiet boy living in a rough town. There are only two important things in his life; playing basket ball, and his girlfriend, Erin. When his coach turns up at his home asking for his help with a new boy at school, Russ, he doesn't know what to think. Especially as, after a trauma, Russ will only go by Boy21, and claims to be from outer space. Why on earth does Coach think he can help? And how is Finley supposed to act around a boy who seems crazy? Despite his odd behaviour, Finley finds he likes Russ, and an unlikely friendship is formed, but one with resentment. Russ is a hugely talented basketball player, and Coach wants him playing again and on the team - and that means taking Finley's spot. But soon Finley learns that some things are more important than basketball, like friendship, the ones you love, and getting over the past. Based on the blurb alone, I didn't really fancy Boy21. I'm not into basketball, and I didn't know what to think of a guy claiming he's from space. But as it was by Matthew Quick, I decided to give it a go, as I loved Forgive Me, Leonard Peacock so much. However, Boy 21 fell pretty flat to me. Finley and Russ are supposed to be 17/18, their senior year of high school, but they both seem so young to me. And along with that, the whole book feels like it's for readers than the boys themselves. Boy21 is set in Bellmont, a pretty rough area. Like stays with like, and so although there's no enforced segregation, the black community sticks with the black community, and the smaller Irish community sticks with the Irish community. There are also bad people, on both sides; drug dealers, people who, if they know you and like you, will "sort out" any problem you have with violence, people who it's not wise to talk about. It's a dangerous place, and you can imagine how that could make Boy21 really dark and gritty. But it's only surface stuff, we don't get into it in any deep way. Ok, so the book isn't about those people, but those people do affect the characters of the book, and there are incidents that are talked about, but it feels too soft. These are seriously awful things, but the book never gets into the seriousness of it, just how devastating it is that these things happen. People are worried about, but the actual actions themselves aren't really touched upon in much detail. It's this that gives the book the feel that it's for younger readers, that it doesn't really cover the severity of where they live. Boy21 is another novel that deals with mental health issues, much like Forgive Me, Leonard Peacock and The Silver Linings Playbook. In this one, it's Russ creating an imaginary life where things aren't so bad, where he still has parents. Before he meets Russ, Coach tells Finley that Russ' parents were murdered not too long ago (not a spoiler, we learn very early on), and calling himself Boy21, saying he's a prototype from outer space to observe Earthling emotions before his parents pick him up in their spaceship is Russ' way of dealing with it. Finley also has his own issues too, a reason for him not talking very much. However, there's less focus on the mental health issues and more on the outward signs of them; Russ' obsession withe being from outer space, Finley's almost muteness. We find out the reasons for it all, but dealing with it feels too easy - just by the two of them becoming friends. It's a different approach to how Quick deals with the topic in Forgive Me, Leonard Peacock, which again makes me feel it's for younger readers. It does make me feel a little sad though; Leonard Peacock and Finley are the same age, yet the stories deal with these issues in such different ways, and it feels like the difference is because of the intended audiences of each book. Boy21 wasn't really my cup of tea. It wasn't awful, but it was far from wonderful, too. Perhaps a good book to introduce early teens to mental health issues without getting too heavy.